great apartment! Very comfortable and clean. The view is fantastic! The swimming pool is great for the whole family! The condominium was clean, comfortable and well furnished. 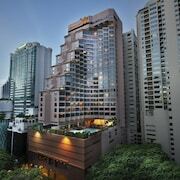 It is conveniently located with BTS Ploenchit Sattion 2 minutes nearby. The staffs are accommodating and hospitable. The room is decoreated with luxury style neatly. Situated in Pak Kret, this condo is 11.8 mi (19.1 km) from Chatuchak Weekend Market and 20.7 mi (33.4 km) from Bangkok Riverside.